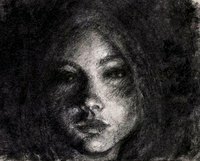 A great drawing technique that can transform your artwork is reverse charcoal drawings. Reverse charcoal drawing creates a dramatic effect and accentuates lights and darks in a drawing. It can also be done of a very large scale for an even more dramatic effect. Tape your drawing paper to your drawing surface. You will need to use paper that is durable and strong with a light texture. A good paper to use is Arches Cover Buff paper. Use masking tape to tape your drawing to the surface. If you use a wide tape, you will actually create a white frame around the image. Color the entire page black. To create a reverse charcoal drawing you need to start with a black page. Use a charcoal stick to color the entire page black. Use your fingers to even and smooth the color. Use a chunky charcoal stick, not vine charcoal. Use a spotlight in the dark on your model or object you are drawing when learning this technique as it will exaggerate highlights and shadows for your to pick up in your drawing. Draw your sketch. Draw using your eraser, erase by adding more black or smearing with fingers. Use your retractable eraser to draw your image as you would normally use a pencil. If you make an error in your sketch, use your finger to fill the line back in with the black charcoal. Use your erasers as drawing tools. The retractable eraser is used to make fine lines. The kneaded eraser is used to take of small amounts of charcoal, creating gray areas. The magic rub erasers will help you create larger white areas. Begin practicing these techniques by drawing an egg, or a shiny can. Then move on to more difficult objects and subjects. If you are making a large charcoal drawing, you may want to wear a mask on your nose to prevent inhaling charcoal.